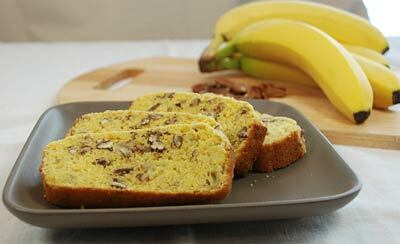 In a large bowl, combine corn muffin mix, milk, bananas and pecans until blended. Lightly coat 9-inch loaf pan with cooking spray and spoon batter into pan. Bake at 350 degrees F. for 35 to 40 minutes or until toothpick inserted in center comes out clean. Cool for 10 minutes before removing from pan and placing on wire racks to cool.